I was about halfway through Stoner when I realized how much it reminded me of The Bridges of Madison County. They both are stories that aren't action packed or driven by mystery, but in the end they pack an emotional punch as you realize the enormity of a simple life told in a simple way. 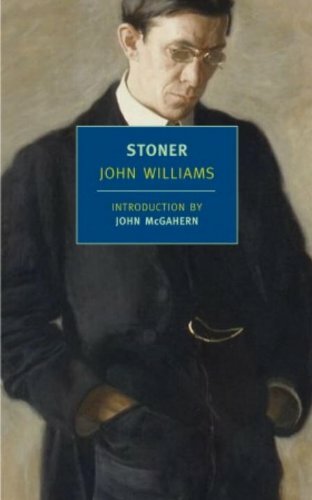 Stoner is a farm boy who comes to the University of Missouri to learn farming only to be taken with literature and never leaving the college, choosing a teaching career over that of a farmer. He takes few risks in life and almost all of them after careful deliberation. He makes mistakes, but makes no excuses. He gains no great reward or honor during his life, but neither does he end up a derelict. He lives his life with a quiet, slow dignity that carries him through until the end. Robin Field does an excellent job with the voices on this recording. Spot on. What more can you write about World War II? Hasn't everything been said already? 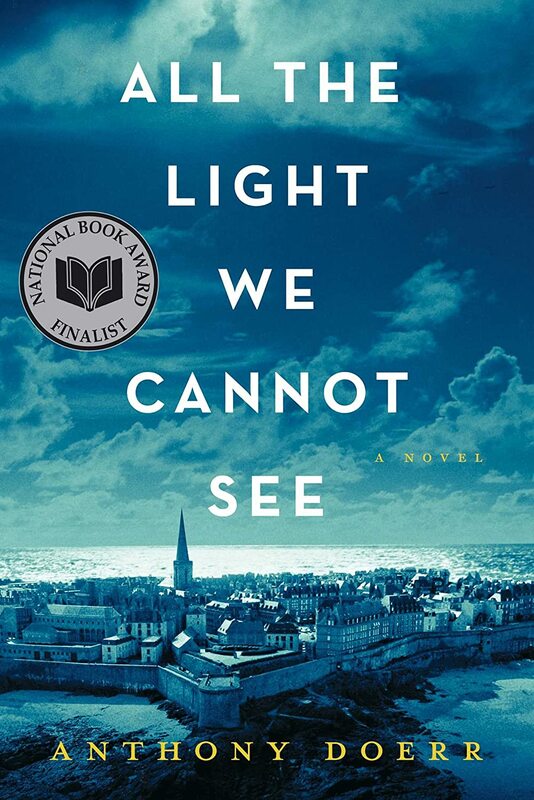 Apparently not, and good for us, because Anthony Doerr has written a jewel of a book about a blind French girl and a orphaned German boy who struggle to deal with a war not of their choosing in All the Light We Cannot See. Woven into the narrative is the legend of the Sea of Flames, a rare diamond with deadly powers. Doerr's book explores the ideas of good and bad/dark and light. Is anyone ever just one thing or the other? When faced with impossible choices, what do you choose? How do you face the world falling apart around you when you can't even see the world around you? Are you the brave one or the one who lives to tell the tale? 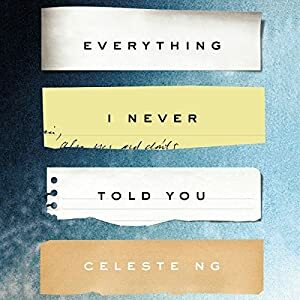 As the book jumped back and forth in time, I began to think of it as a constant cliffhanger--always leaving me wanting more as it quickly picked up the last story. That made it a true page-turner, although in this case I was listening to an audiobook and finding excuses to keep driving. Really great book. Highly recommended! I guess if you grew up taking Massachusetts or Maine History classes in high school, you might have heard of the Penobscot Expedition, but otherwise, it’s probably nothing that hit your radar. In short, it was a disastrous foray of Americans from Massachusetts into the Penobscot Bay in Maine, the purpose of which was to forcibly remove a British garrison that had established itself on the Majabigwaduce peninsula and had begun building a fort. The Massachusetts men comprised both an army and a navy and the officer in charge of the artillery was none other than American hero and Son of Liberty, Paul Revere. Despite outnumbering the Redcoats, the Expedition ended in an all-out rout of the Americans and the destruction of the entire Expeditionary Fleet. After the troops’ ignominious return to Boston, the blame game began and many fingers were pointing at Paul Revere, accusing him of disobeying orders, being generally lazy, and being a coward. 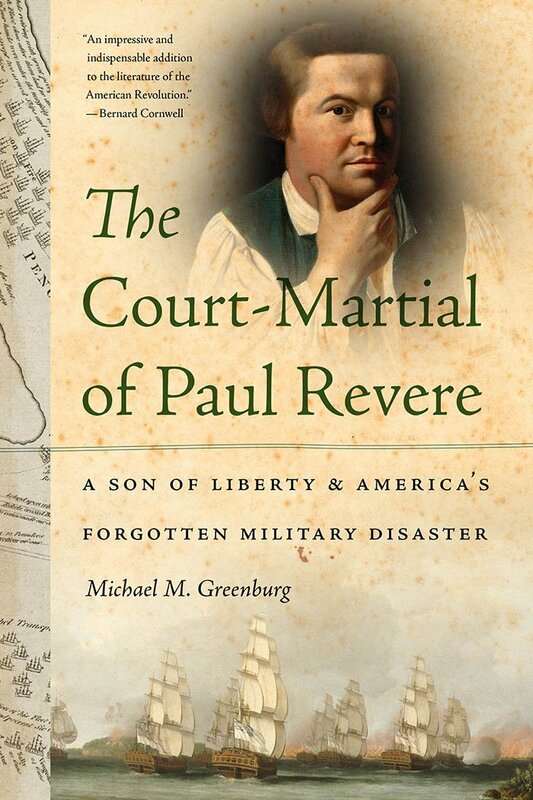 Author Michael M. Greenburg has created an altogether readable book on the entire affair beginning with Revere’s famous ride, its aftermath, his part in the Penobscot Expedition, and the court-martial that followed. The book is obviously well-researched but it doesn’t end up reading like a textbook. Instead, it is a gripping account of the doomed siege and its players and paints Revere in a different light than what you might have been brought up to believe. I enjoyed Revere's story, but I also liked this book because it’s been a long time since I’ve read any history on the Revolutionary War. Greenburg does a really fine job in describing the general events that led to war and then placing the particulars of the Penobscot Expedition in context. If I could change one thing about this book, I wish there was a good map of the area around Majabigwaduce. Greenburg includes some hand-drawn maps contemporary with the Expedition, but a larger, more readable map would have helped me better place the action he describes. A well-done history book! Highly recommended! We are already well into February and I realize that most of you have not been able to sleep because you have been waiting for My Favorite Books of 2014 post. Blame Captain America. He has been home a lot lately and I have been entertaining him instead of writing blog posts. I notice as I look through my records that I didn't review a whole bunch of books toward the end of the year. Blame Captain America for that, too. I don't know why, but I blame him for most things, so he won't notice one more. The past several years I set a goal for myself to read so many books and usually felt so rushed to do it that I got kind of crazy at the end of the year. In 2014 I told myself to slow down and read some long books. That was a good idea, because I read some great ones. Interestingly, I ended up reading twenty books in 2014 just as I did in 2013. That has everything to do with the boss saying we could no longer work from home and had to come back into the office. Thank you, Audible, for helping me keep my sanity. So here are my top books of 2014. As always, these are books I read in 2014, not necessarily published in 2014. I loved this book and can't believe that it has been around since the 1950s and I had never heard of it. 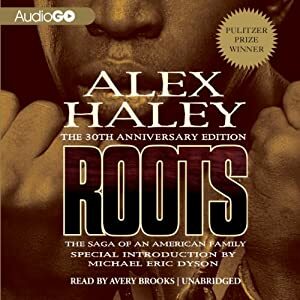 It has everything a great audiobook should have--an epic story and a wonderful narrator. I couldn't imagine when I started the book how exciting it would be. I expected a rather dry, scientific tome with lots of snow and ice and cold, and it was anything but (well, there was a lot of snow and ice but the cold didn't seem to bother them as much as it would bother me). 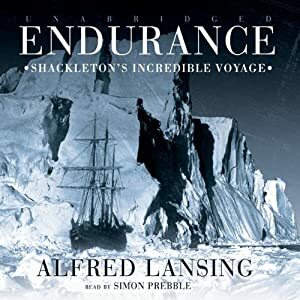 As Shackleton and his troop try to get back to civilization after being stranded on a expedition to the South Pole, they faced seemingly impossible odds. Just when I would think that things couldn't get any worse, they would. I would catch myself saying out loud in my car, "Oh my God!" and a few minutes later, "Oh my God!" And yet despite each setback, they soldiered on. If you're looking for one audiobook to get with your next credit, this should be it. This is a small jewel. As an audiobook it's only 6 hours long, but it packs a lot of emotion into those few hours. 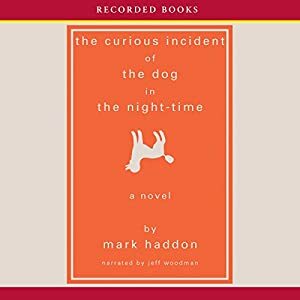 Christopher, the book's narrator, is an autistic boy trying to find out who killed his neighbor's dog, Wellington. As he conducts his investigation, the more he finds out, the more he finds his whole world unraveling. A must-listen! I've done a full review on this one here, but suffice it to say it's as good as I remember the TV show being. And that's good! I received this book as part of the LibraryThing Early Reviewers program in exchange for a review which you can read here. 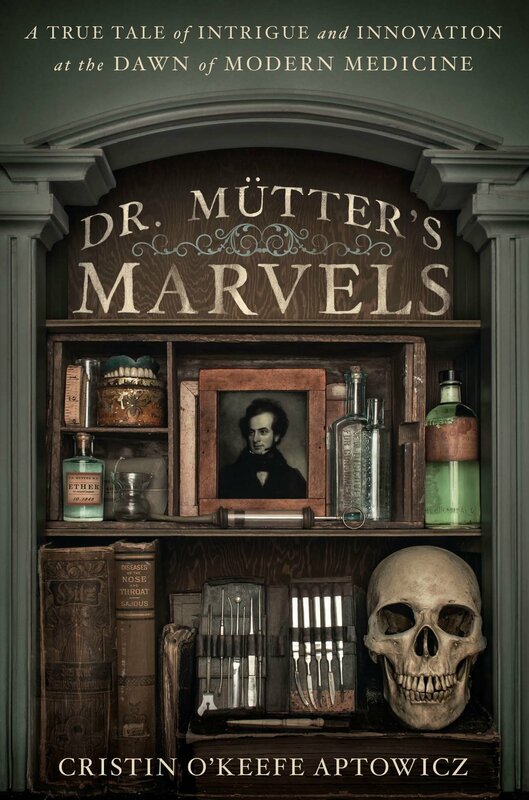 It is a quirky little book that taught me a bit about medicine back in the day. Neat read! I've had this one in my library for a couple of years, but decided I finally needed to listen to it. I've seen several TV and movie adaptations of the book, but I don't believe I've ever read it before ths. 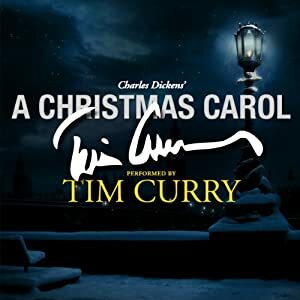 Tim Curry is amazing as a narrator. Listening to this book was a great way to wrap Christmas presents! One of my favorite books of all times is Tess of the D'Urbevilles. I like it for the same reason I like Everything I Never Told You--because one decision, one circumstance causes a chain reaction that lasts for years, and you're left playing the "what if that never happened" game in your head for a long time. Amazon editors as the Best Book of 2014. It's easy to see why. I thought the characters were really well drawn and believable. You know from the first sentence that Lydia is dead, and yet as the book progressed I kept hoping that something would break that chain reaction--but it had started long before Lydia was born. Great narrator, too! 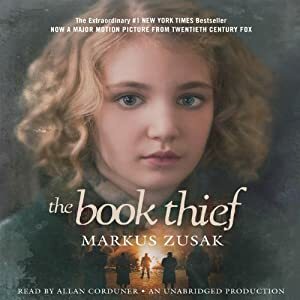 Young girls living through the horrors of World War II seems to be a popular theme in books these days (I'm looking at you, All the Light We Cannot See), and The Book Thief shines as one of the best. You can read my full review here. 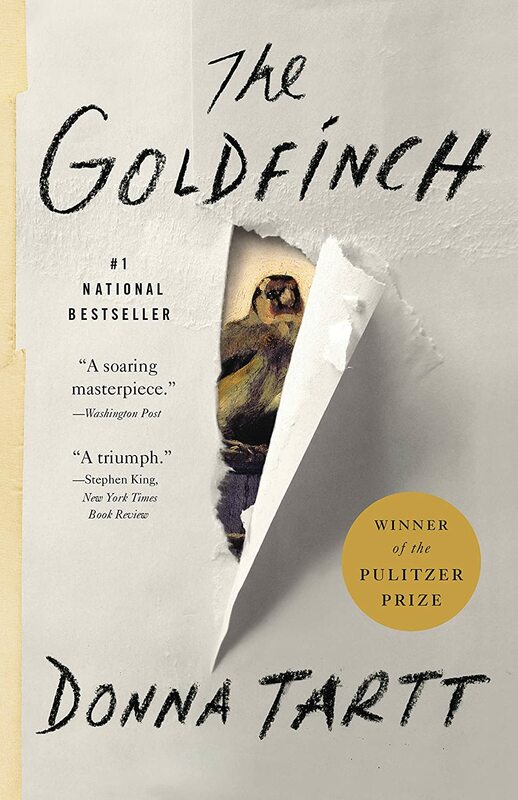 Everyone was reading The Goldfinch, especially after it won the Pulitzer. It still makes me dizzy to think about. You can read my full review here. 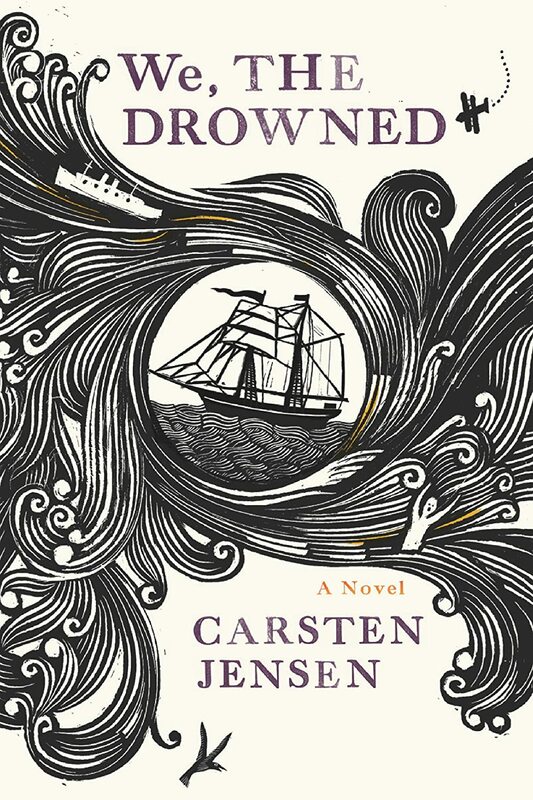 I started the year off with We, the Drowned and it set a high bar for all the books that followed. I was looking to read an epic, and I got it. You can read my full review here. So there you have it. Nine books that got either 4.5 or 5 stars this year. There were others that came close with just 4 stars and some that didn't come close at all. You can check out the full list on LibraryThing.com. It's February! The best month of the year. Why? Because everyone's all full of love and kisses--and HEARTS! Here are the hearts I made for my house this February. One of the things I love about working with old books is the endless assortment of fonts and page colors. It sounds silly, but I really do get mesmerized by it all. So for this project I decided to show some of them off. Check out the whites, tans, and ochres. Tight font, loose font. Big letters, tiny letters. I heart them all! So in honor of Fabulous February, I am introducing <insert fanfare here> my first tutorial! First paint your canvas. I used Martha Stewart Glossy Acrylic Paint for this project. I started by painting my canvas a bright valentine-y red. swiped it back and forth a few times. 3. Then just to add a little more depth I added a couple of dots of red and swiped everything again. 4. Let the paint dry. This takes about an hour, so go do something fun. I went to my son's house and watched his Mastiff try to dance upside down. Her sister, the German Shepherd, was having nothing of it. 5. Once you come home, make a heart template out of cardstock. You can find a heart design on the Internet or in your favorite word processing program. I made mine so it was about 6" across. Print it on the cardstock and then cut it out. 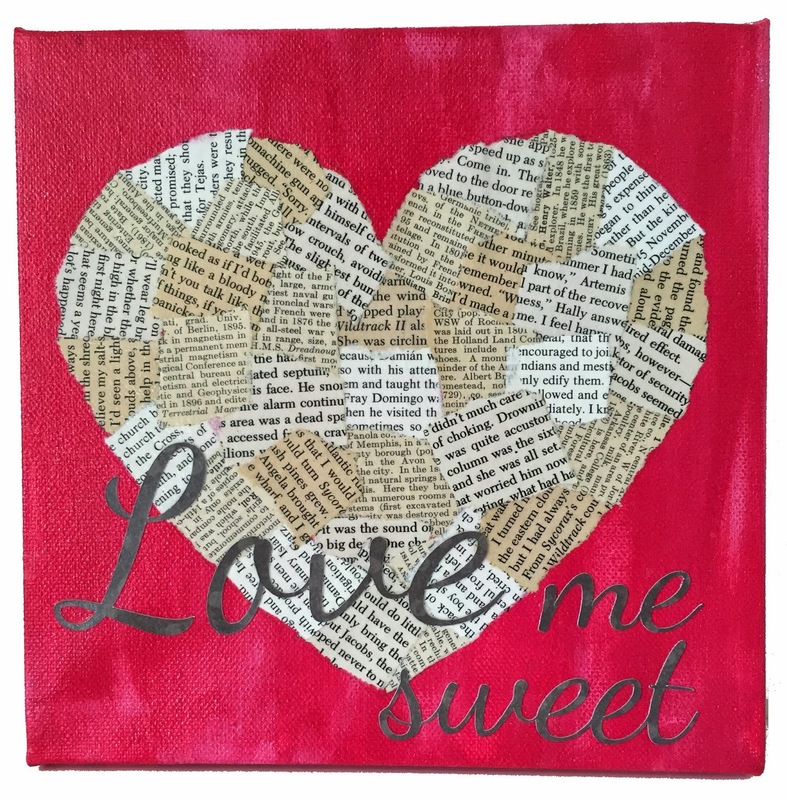 Lay the heart template on the dried canvas and use a pencil to lightly outline the heart on the canvas. 6. Now for the paper part. 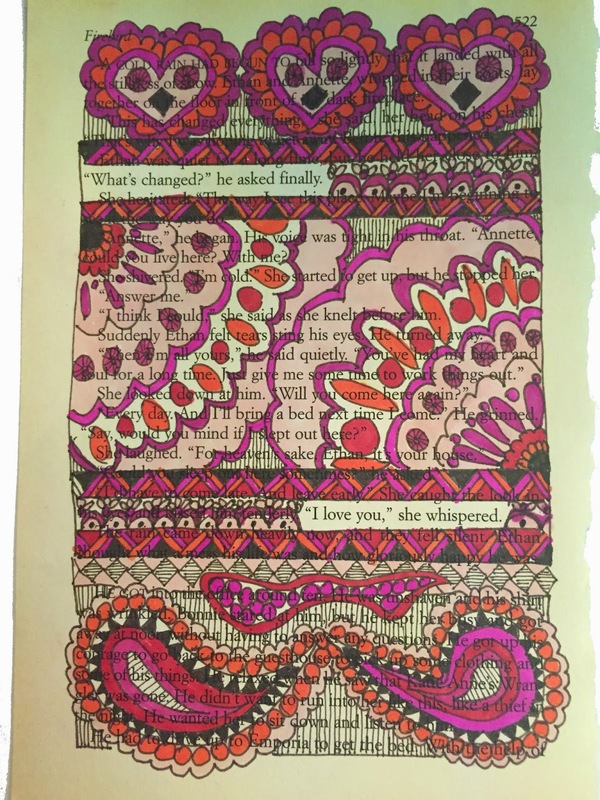 Remove some book pages from their books and tear them into strips about 1" wide. I chose pages from four different books and took about five pages from each. I chose pages that were different colors and with different fonts sizes. Tear the strips into pieces that are roughly 1" square. 7. Next, Mod Podge the paper squares to the canvas. I used the glossy Mod Podge, because. That's right, because. I started by gluing the first square right below the point of the heart. Then I glued the second one right below that. Alternate the color of the squares as you work your way down to give the heart a mosiac look. When you get to the bottom, align the edge of one of the squares with the inside edge of the heart. I found it easiest at that point to continue working along the edge of the heart, lining up the edge of the paper squares with edge of the heart. When you get to the curve, shape the squares by tearing off little bits at a time until each matches the curve you need. Once the outline is done, Mod Podge away until you fill in the middle of the heart. 8. Let the Mod Podge dry. It takes about an hour. I spent that time thinking about my recent Hawaiian vacation. If you don't have any memories like that, you can borrow mine. Here's one. 9. 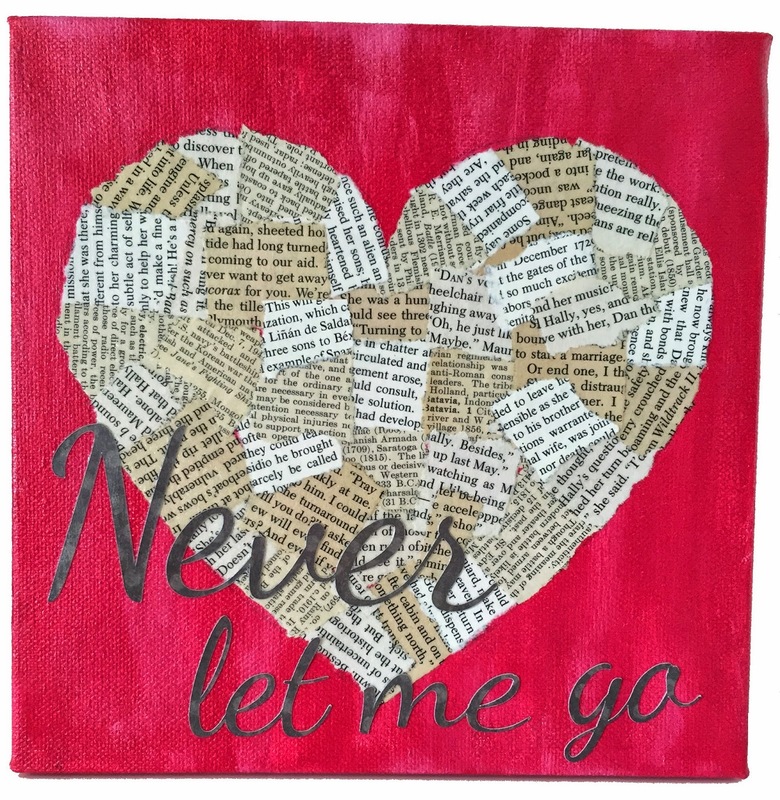 Finally, add some romantic lyrics to your canvas. 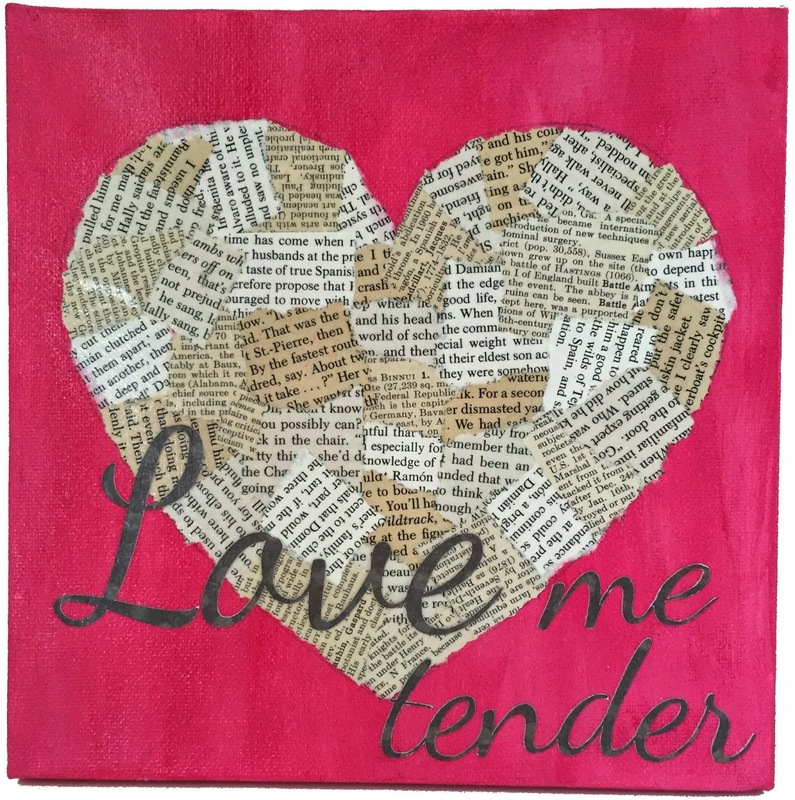 I chose lyrics from Love Me Tender, because it has been one of my favorite songs since I saw the movie of the same name at the drive inn when I was about 5 years old. I mean, c'mon, remember this scene at the end?? Isn't it everyone's favorite song after that? I cut the lyrics out of a dark grayish-brown cardstock using my fancy-dancy Silhouette machine. I thought about cutting them out of vinyl, but then I asked Babette whether I should use paper or plastic and she said, "Paper. Duh." Well, actually, that's not exactly how she said it, but regardless she was right. That's why I call her for advice. Duh. The font I chose is called Dancing Script OT, and I think it is swell. I made the first word on each canvas (Love, Love, Never) slightly larger than the other words. And then the words and I had a Mod Podge party all over the canvas. 10. Repeat for the other two canvases. I'm sorta in love with how these turned out. They really were easy and I was able to finish them in an afternoon. I think I see lots of little book page squares in my future.